Kneeland Properties Rendering. Rendering by HGA. MILWAUKEE –– Menomonee Valley Partners, the City of Milwaukee, and UWM’s School of Architecture and Urban Planning’s Community Design Solutions revealed a vision to transform more than 40 acres of land remaining in the heart of the Menomonee Valley during an event today at Potawatomi Hotel & Casino. Design concepts are the culmination of the Menomonee Valley Design Charette and lay out a vision for sustainable development on five vacant or underutilized riverfront sites as well as streetscaping for the St. Paul Avenue corridor. 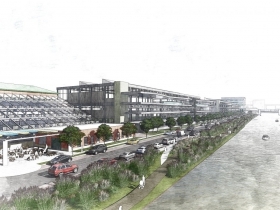 Concepts highlight potential for the next phase of Menomonee Valley revitalization, including new businesses, an extension of the RiverWalk along the Menomonee River, and physical connections to adjacent neighborhoods. “The two most important factors in the transformation of the Menomonee Valley have been vision and collaboration. That is why I have been enthusiastic about the forward-looking design work that so many stakeholders have contributed to,” said Mayor Barrett. The Menomonee Valley Design Charette, held January 31, 2018, was a full day public planning session with six local architecture firms matched to each of the sites. 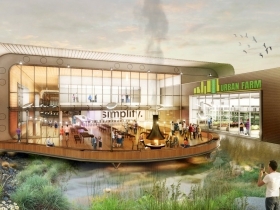 Using the Valley 2.0 Plan, extensive research, and focus group discussions, the firms created innovative design concepts for high-quality, sustainable, job creating development. Map of Six Valley Sites. Map by Community Design Solutions. In the last two years, six businesses have opened on W St. Paul Ave between 11th and 25th streets. Quorum Architects proposes expanding the showroom, gallery, and food destination theme, along with sidewalks, lighting, and greening that welcomes pedestrians. 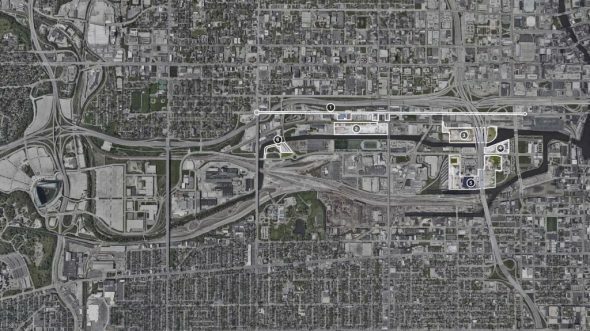 Park space, outdoor recreation, and pedestrian connections to the 16th Street Viaduct and Hank Aaron State Trail provide links to the broader community. With the site’s four-block-long riverfront presence, Zimmerman Architectural Studios visualizes a riverwalk extension, new street access from 25th Street to Emmber Lane, and three mixed-use commercial buildings that engage the riverfront. Proposed development includes food production and sale, light industry, and office or other uses. The easternmost building could connect the 16th Street Viaduct to the riverwalk. 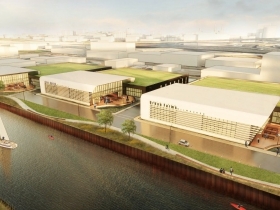 On the 9.8 acre vacant parcel adjacent to the downtown post office and Milwaukee Intermodal Station, HGA envisions a new street grid to reach destination food and beverage manufacturing and retail, mixed use office, and light manufacturing facing an active riverwalk with boat slips. Access to food grade steam is ideal for food and beverage manufacturing. To connect the site to the city grid, HGA innovatively suggests extending Mt. Vernon Avenue under the 6th Street Bridge, traveling on grade along the river and through the existing colonnade under the post office, to Plankinton Avenue. Wetland features with native vegetation provide a dual use amenity and stormwater management component, mirroring the Menomonee Valley Industrial Center on the Valley’s west end. Engberg Anderson Architects proposes a catalytic gateway and entertainment hub for this highly visible riverfront site near the Harley-Davidson Museum. The existing silos would be repurposed as a focal point, embracing the site’s industrial nature. 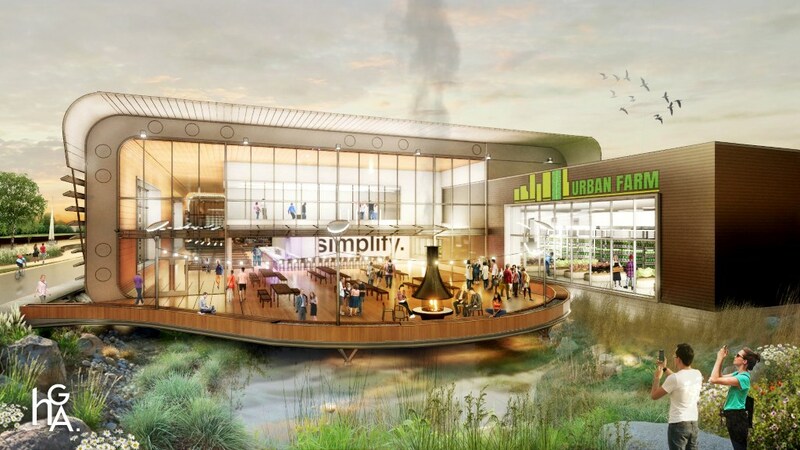 They propose a mix of food manufacturing, retail, office, hotel, and restaurant around a central space connected to a riverwalk extension. 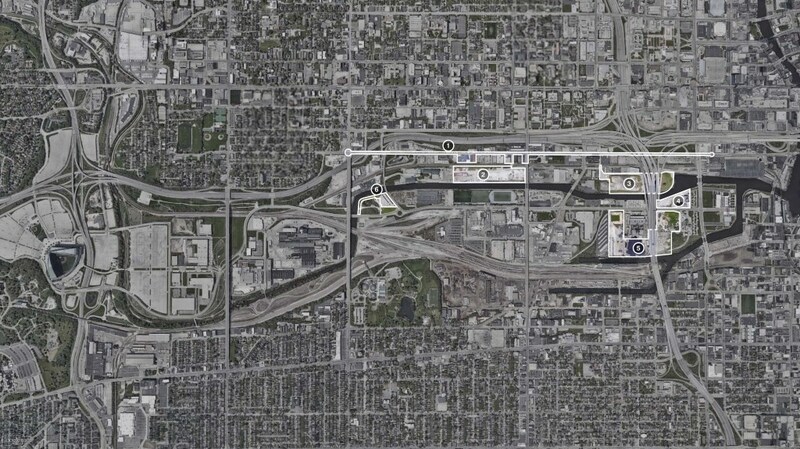 This 22-acre parcel wraps around We Energies and runs adjacent to the Menomonee Canal to the south. 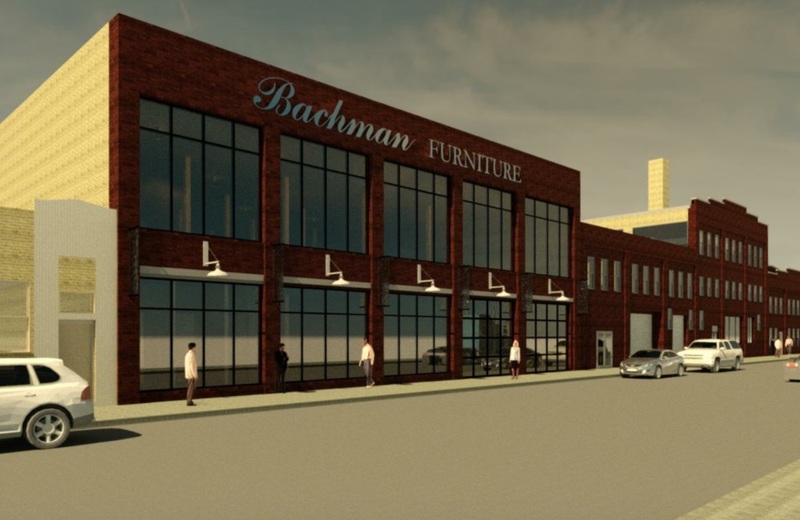 New construction on this 22-acre site can capitalize on adjacent food grade steam for facilities, manufacturing, and food and beverage production and retail. 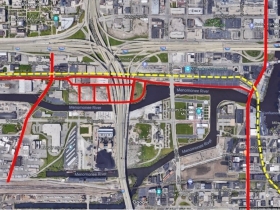 The size of the site and proximity to entertainment destinations, with frontage on both Canal Street and the Menomonee Canal, make it attractive for a manufacturer with a retail/tourism component. With a prominent location on 25th and Canal Streets, this site sits between the Hank Aaron State Trail and the Menomonee River. The existing building has a steel structure which could be renovated for a single tenant or multiple smaller tenants, possibly a combination of food manufacturing and visitor’s center, retail outlet, or themed restaurant. 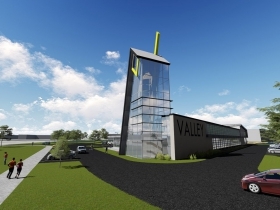 A proposed addition provides opportunity for a highly visible vertical landmark and entrance point to the Valley. Key features of the proposed development include trails around existing ponds, vegetation, and trees, as well as a boat launch. 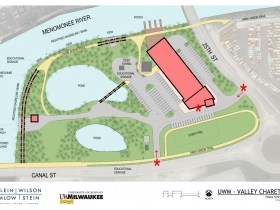 A street-facing event pad could be a launching point for walk/runs, river events, or other activities tied to the Hank Aaron State Trail, the Valley, or Menomonee River. The Menomonee Valley Design Charette was facilitated by UWM’s School of Architecture & Urban Planning’s Community Design Solutions, in partnership of Menomonee Valley Partners and the City of Milwaukee. The Fund for Lake Michigan, the Greater Milwaukee Foundation, and the Herzfeld Foundation provided funds to support efforts to envision the future of this land. To view the full results from the Menomonee Valley Design Charette, visit RenewTheValley.org. Menomonee Valley Partners is a nonprofit organization formed in 1999 with a mission to revitalize and sustain the Menomonee Valley as a thriving urban district that advances economical, ecological, and social equity for the benefit of the greater Milwaukee community. Since then, 50 companies have moved to or expanded in the Valley, more than 5,000 jobs have been created, 60 acres of parks and trails have been established, and 10 million people visit the Valley’s recreation and entertainment destinations each year. This looks great. I would use it all. Let’s do it. advantages of this area that will soon become crucial. Climate collapse is going to cut us off from sources of some things we need. Costs of producing and shipping some things we need will be prohibitive. Forced new needs will drain funds from existing needs and activities. needs, or induce us to meet other’s needs. this area’s strategically critical access to rail and navigable water. and other elements, they can be accommodated elsewhere. The highest uses for this area will be to protect us from the effects of these new problems. Lastly, such use will produce more jobs and economic payback per acre than the existing proposals.